CP 1308 scenario with no start and no end date. 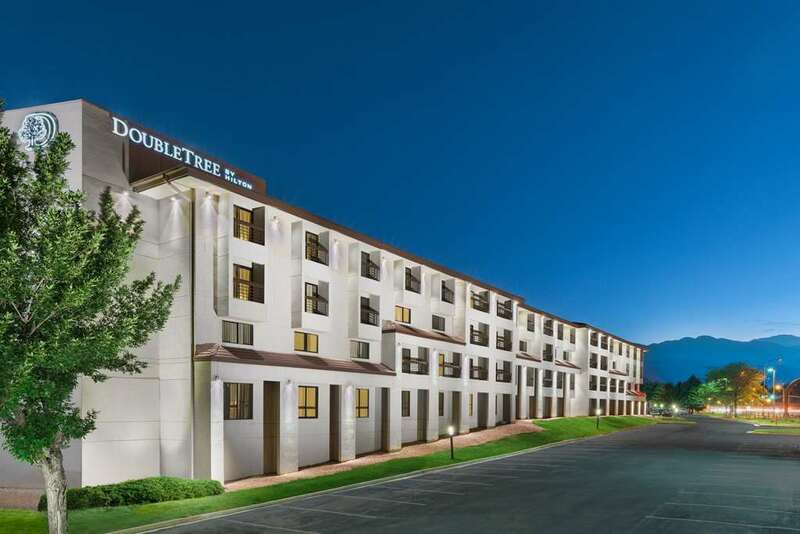 The Doubletree Hotel Colorado Springs by the World Arena just off I-25 offers scenic Colorado Rocky Mountain views of Pikes Peak and Cheyenne Mountain ten minutes from Colorado Springs Airport. Enjoy our hotel amenities for your business or leisure travel. The Best Choice of Colorado Springs Hotels A friendly and courteous staff warm ambiance high-speed Internet access and convenient location are only a few reasons to plan your next stay with us. Enjoy a convenient casual breakfast lunch or dinner in our hotel restaurant Atrium Cafe. Nearby the World Arena is just three blocks away and we*re located within walking distance of restaurants shops and a 20-screen theater. Our spacious lobby business center two lounges heated indoor pool inviting exterior courtyard fitness center and well-appointed /interior corridor/ guest rooms complete the perfect setting for your Rocky Mountain getaway. Visit Pikes Peak Cog Railway the Cave of the Winds ancient Native American cliff dwellings at Manitou Springs the U.S. Olympic Training Center or the **Garden of the Gods. ** Enjoy hiking fishing horseback riding and the great outdoors. After golfing sightseeing jogging or hot air ballooning revive by our patio fountain savor American cuisine in a relaxed setting at the Atrium Cafe or dance the night away at Maxi*s Lounge. Your comfort is guaranteed. As always our very special warm chocolate chip cookie at check-in and don*t forget to check out our Colorado Springs hotel specials. Made Market: The Doubletree Colorado Springs boasts a new grab-and-go cafe. Made Market is perfect for guests who would like to get a quick bite before a busy day and features Starbucks Coffee teas lattes Frappuccinos and more.